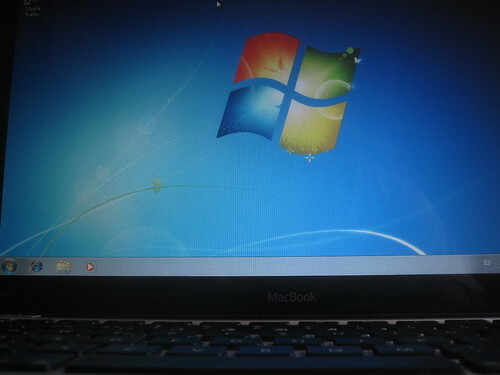 Windows 7 running on a MacBook. Photo by Esparta Palma	. Windows 7’s buzz has been overwhelmingly positive, in stark contrast to the rough ride upgrading to Windows Vista. The scene is of particular interest to visualists. The Windows OS, for better or for worse, is still the best OS out there as far as supporting a full range of the latest-and-greatest video cards. The Mac is restricted in its choices, and proprietary Linux graphics drivers – sadly – are still often plagued with issues. While it’s on Create Digital Music, and while the subject of the discussion is Noel Borthwick of audio developer Cakewalk, the story should be considered a must-read for anyone interested in visual development and production on Windows. The multi-touch thing is a particularly big deal, because it means – even if you don’t use Microsoft’s own tools for multi-touch support – multi-touch hardware is likely to become more prevalent in the marketplace. The other news for Windows-based visualists is that we’re finally getting some decent out-of-box codec support. Now, I tend to rely on GStreamer and (in software like Blender) FFMPEG for video support, but on the other hand, if this means avoiding sometimes-fraught installation of the middling Windows port of QuickTime, I’m all for it. Yes you read that right – QuickTime MOV file support is now natively available in Windows 7 so you don’t need to install QuickTime. Another big plus is that this is supported under the X64 version of Windows 7 as well, something you cannot do with Apple’s native QuickTime itself! All media files using these codec’s should play in Media Player. It appears that these new codec’s are exclusively available to Media Foundation applications and not via other legacy API’s such as DirectShow etc. Windows developers, I’m curious, do any of you expect to make use of Media Foundation codec support, or are you focused entirely on GStreamer, QuickTime, FFMPEG, and so on?